Now offering pick-up and drop-off in the Bay Area! Do it once, do it right, enjoy for the long-haul. Let's properly protect the works that you love. This means using all archival materials and following only best-practice protective mounting techniques, frame craftsmanship and assembly, and safe handling from start to finish. Idea: Parents, if you properly frame your kids' weird/great childhood paintings, they'll look sharp on your walls, you'll be surrounded by happy memories, guests will learn something about you and your family, and you'll have heirlooms for generations. 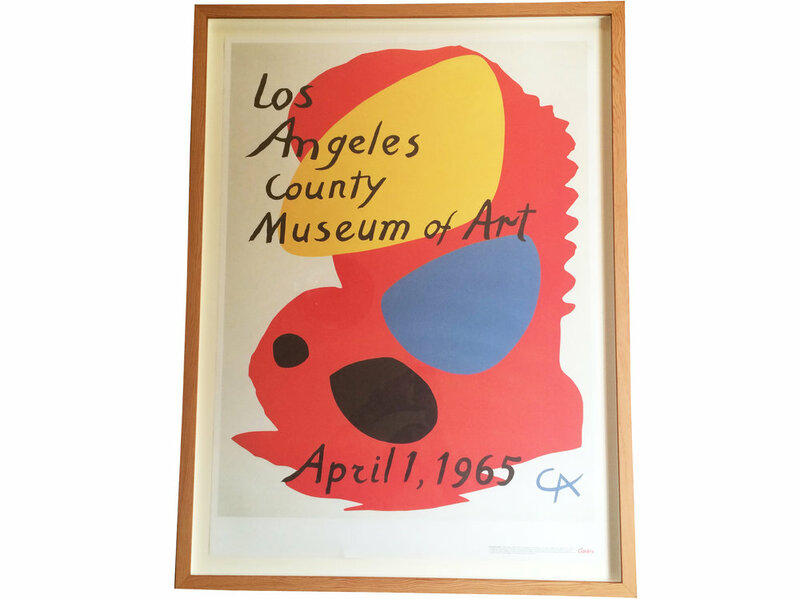 Proper custom framing for this great LACMA poster done in 2016 with reclaimed CVG doug fir helped warm up a beautiful home in LA. I started out in Portland OR in 2010 using moulding that I milled from reclaimed gorgeous old-growth doug fir lumber, and with a focus on eco-friendly materials and low-impact processes. Many frame shops use production-line moulding from factories overseas and nasty stains, paints, and colorants. IKEA stuff is gross in so many ways. I do it differently. This means efficient use of eco-friendly materials, increasingly energy-efficient work processes, minimizing vehicle use (in Portland, I often bike-delivered frames for neighbors), making my own moulding locally, and, yes, I'm still using that reclaimed doug fir. When I worked at SFMOMA in the early 2000's, I admired their incredible framing of works on paper and I set out aspiring to the spirit and quality of that work: to support and not collide with the art, help the environment feel right, treat the artworks as priceless objects. I use beautiful woods - reclaimed doug fir, walnut, maple - and, unless you'd like something else, I tend to let the tones and grain speak for themselves. Natural wood frames will bring warmth and a feeling of health and vitality to your home. Let's re-frame the art on your walls currently either not protected properly or in crappy frames - it'll make a huge difference in refreshing and upgrading your living spaces. Big bang for the buck. Easy on your decision-making energy. I've walked into many frame shops before and been completely overwhelmed by the options and prices and underwhelmed by both the aesthetics, materials, service, and craftsmanship. How about this: I'll do this one thing that tends to look real good that is pretty standard for modern and contemporary art museums, I'll give you a couple options for type of wood and finish and then we're good to go. It should take about a week. I can pick up and deliver if you'd like. And it's just me you'll be working with. Simple, groovy. Easy on your day-to-day. Your time and energy is scarce - the way I do things is sensitive to that. I'm easy to get to in Berkeley, but if it helps you: I'll pick up your art and drop off your finished frames. I can also help you hang the work if you need a hand. Fair pricing. I got into this because when I moved into my home I couldn't afford to have the stack of art that I'd accumulated over the years framed well. I want other artists and working people to be able to afford to have things framed properly. Volume discount. Most of my customers bring me one or two things then are so happy they keep bringing me stuff. 10% discount if you want to frame 3+ works. 5 frames for Nate and Beth, who have chosen to devote wall space to their daughters' paintings instead of "cool" art or "decor". If properly framed, your kids' artwork will a) be protected for the long haul - you'll create a family heirloom out of your special memories; b) make your home feel more warm and personal to you; and c) your care and presentation of these treasured family documents will tell your guests something about your values and who you are as a parent. Why hang impersonal art and "decor" on your walls? Pfffffff . . . by framing properly and hanging your kids' artwork, you'll be seeding starters of meaningful conversations with guests. So many birds are killed with this one stone - - - frame your kids' artwork! Let's do it. Architects, design-build types, contractors, homeowners - let's frame up the documentation of your best work! Will look great in the office. Would make an incredible thank-you gift to the homeowner or builder on your project. Susana, you hit the nail on the head - the 2010 Giants World Series victory was special for me too. Good call getting these newspaper leaves framed up, protected (unless blocked properly, UV rays will yellow the newspaper), and getting them up on your walls. Go Giants. "I procrastinated for years on getting some prints framed that meant a great deal to me. Each time I moved apartments, or relocated cities, somewhere along the way I would damage a corner or tear one of the prints. Not to mention I was tired of my apartment resembling a college dorm with posters held up by thumbtacks. I finally surrendered and sent them to Neal. He made the entire process effortless. The finished products were stunning. Gallery-quality framing with the warmth of reclaimed wood. Neal is a true craftsman and his work shows it. He even delivered to me in LA!" "Neal framed a photograph which depicts my grandmother's hands in the act of throwing a ceramic pot. The picture is both a cherished artifact from my childhood as well as a document and reminder of the life of a person who I have no memories of due to my young age at the time of her passing. What I love most about the frame is the way the photo is hung: it isn't flattened against the backing, but rather sits naturally, letting the creases and bends in the print be a part of the piece as well. For this reason, I think the frame succeeded in preserving the physicality of both the form and content of the photo. The finished piece points to the careful attention and understanding which I believe Neal brings to every frame he makes." "I actually interned for Neal on the Obama campaign in Nevada in 2008. The campaign gave me this incredible Shepard Fairey print after we won. 7 years later, I move to Portland and Neal frames it. How's that for full circle? It's beautiful - I'm so glad this memento of that special time is now safe, protected, and up on my walls so I can remember every day: Yes We Did." "Neal's work is beautiful, timely, and cheaper than anything local (NYC). He obviously takes great care with the artwork and approaches each piece thoughtfully. I'd send him more stuff if I didn't already run out of walls." "I had this incredible penguin drawing unfortunately for years in a black made-in-China frame that was increasingly falling apart with each of my moves. Neal re-framed the art in a gorgeous old-milled cherry wood and also re-did the mounting of the drawing to ensure safety and protection of the paper. It was really cheap and easy." "No more janky IKEA frames! I brought my little art collection to Neal and I'm so glad I did. Neal's simple, beautiful wooden frames do justice to my little living room art gallery. He's great to work with and had some creative ideas for how to best present my pieces."